Wilmington visitors who are in the mood for a big, juicy steak or a signature burger can head on down to the Port City Chop House. Elegant and a fine date night destination for carnivores, this steak house is sure to appease any craving for a refined but ultimately filling meat-lovers’ meal. 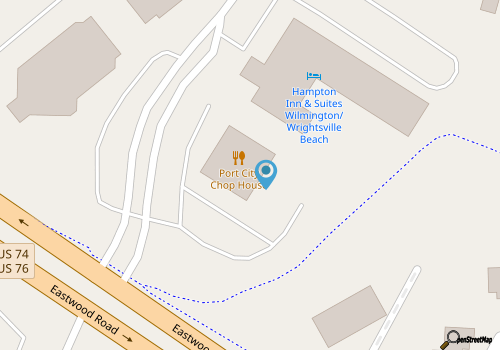 Port City Chop House is located in between Wilmington and Wrightsville Beach, and is fairly unmistakable thanks to its expansive exterior and big outdoor neon sign that hangs over the entrance. The inside is just as distinctive, with big wooden booths and tables and a central fireplace, which creates an inviting setting. The lunch and dinner menus share this slight extravagance, with a wealth of dishes that are rich and are designed for hearty, elevated appetites. Patrons can start with an appetizer of Oysters Rockefeller, Bruschetta, crab dip or baked brie, follow with a chopped, bistro, or spinach and oyster salad, and then dive into the main course, which naturally, centers around Angus steaks and signature chops. Rib eyes, New York Strips, and filet mignons can all be found, and there is an equally nice selection of add-ons to choose from, like Cajun style, smothered with mushrooms and onions, and coupled with lobster tail. Richly filling, the Port City Chop House will become a favorite destination for meat lovers.